Rub beef tenderloin with freshly ground pepper. Heat some olive oil in a large frying pan until hot but not smoking. Brown beef on all sides for approx. 10 - 12 min. Set aside to cool. Finely chop shallot. Pick herb leaves and chop roughly. Cut mushrooms into cubes. In a large frying pan, heat butter and remaining olive oil. Add shallot and mushrooms and sauté until translucent. Deglaze with white wine. Add salt and chopped herbs. Continue to sauté for approx. 10 min. until the alcohol has evaporated. Remove from heat and allow to cool. Transfer mushroom mixture to a food processor. Blend until smooth. Lay out a large sheet of plastic wrap on a cutting board. Line up half of the bacon slices in the middle. Spread mushroom paste over bacon. Then place beef tenderloin on top. Spread the remaining mushroom paste over the beef and cover with bacon slices. Tightly wrap beef with mushroom paste and bacon by wrapping up the plastic wrap. Cool in refrigerator for approx. 30 min. Preheat oven to 180°C/350°F. On a lightly floured work surface, roll out puff pastry into a rectangle. Remove beef from the plastic wrap and place lengthwise in the middle. 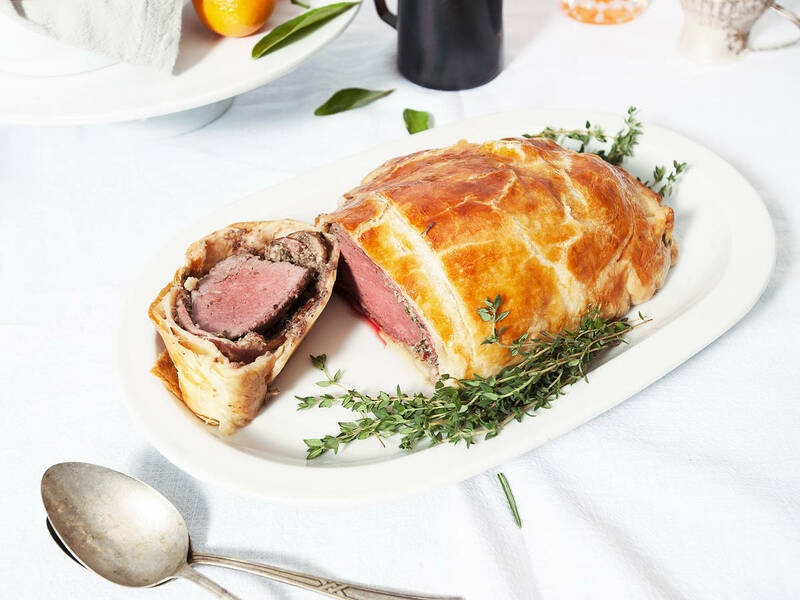 Wrap pastry around beef so long sides overlap. Fold in short sides and tightly seal. Transfer to a lined baking sheet seam side down. Brush with egg yolk and bake in a preheated oven at 180°C/350°F for approx. 10 - 15 min. Then reduce heat to 120°C/250°F and continue to bake for approx. 10 more min. until golden. Remove from oven and allow to rest for approx. 10 min. Enjoy with a fresh salad or vegetables.